In late 2016, BGC Asphalt introduced a mobile batch mix plant to its fleet, but nearly a year later and with an array of regional projects in the pipeline, the business needed another mobile plant to meet demand. 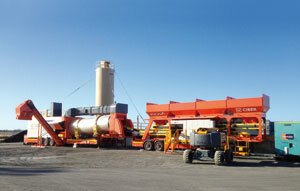 Securing a contract at Busselton Airport, about 250 kilometres south of Perth, and another remote airport project near Newman, 1200 kilometres north of Perth, soon after, the Western Australia-based firm needed to complement its existing mobile asphalt plant with a high-capacity set up. “We needed an extremely mobile, highly productive and unique plant in a short timeframe, and Wirtgen was able to deliver that,” explains Craig Hollingsworth, General Manager – BGC Asphalt & Quarries. Ciber Equipamentos Rodoviários – or Ciber – part of the Wirtgen Group, which incorporates the Wirtgen, Vögele, HAMM, Kleemann and Benninghoven product brands, specialises in asphalt mixing plants for Latin America, Africa, Australia and New Zealand. In 2015, it launched its Ciber iNOVA 2000 mobile asphalt plant, which BGC Asphalt identified as the best fit for its operations. The Ciber iNOVA 2000 plant provides a high-production capability in just two mobile units, helping to minimise transportation and installation costs while also maximising production output. These production benefits, given its mobility and adaptability for remote jobs, made the Ciber iNOVA 2000 the ideal fit for BGC Asphalt. “While the Ciber iNOVA 2000 is a fairly simple asphalt plant design, nevertheless it’s able to produce the mixes we need, such as polymer-modified bitumen and the special bitumen mixes required in those remote locations. It means we have the capability to supply a large range of asphalt to almost every point in Australia,” says Mr. Hollingsworth. While opting for the basic equipment set up with an additional storage silo, Mr. Hollingsworth asserts that the beauty of the Ciber iNOVA 2000 lies in its significant production capability. “One of the most important things with the iNOVA is that our people can set it up in two to three days and it’s easy to use. That means that we can take this plant 1500 kilometres away from Perth and produce 200 tonnes per hour after a two-day set up, which is a real benefit to our business,” he explains. Mr. Hollingsworth says the plant is ideal for Western Australia, and ticks all the boxes for the business in regards to completing jobs in remote locations – something that is a significant bonus for the Perth business. For the Hazelmere-based business, the added bonus of the Ciber iNOVA 2000 and it coming under the Wirtgen Group brand is that the manufacturer’s main workshop is just one suburb over in South Guildford. Wirtgen Australia worked closely with BGC and the factory engineering team to ensure the iNOVA 2000 met all of the compliance requirements prior to being fully commissioned. Wirtgen’s local support team, led by in-house engineer Ash Johnson, was able to ensure a smooth program of engineering modifications that were completed on time. Mr. Hollingsworth adds that the company’s experience with Wirtgen Group machines in general has been an extremely positive one. BGC Asphalt’s current fleet includes a Ciber iNOVA plant, a Wirtgen W35Ri Road Profiler, a Vögele Super 1303-3 Road Paver, an HD14TT Pneumatic Tyred Roller and two HD14VO Tandem Vibrating and Oscillating Rollers.